I apologize in advance but I’m not gonna make a full review out of this chapter. Partly due to the fact that the English translations I usually read and link to (by Jai) aren’t out yet, partly because it’s been over 2 weeks since the chapter was out, partly because what happened on this chapter was a little anticlimactic considering what happened on the previous chapter and what we all were led to believe would happen on this chapter and partly because I am simply not in the mood. I haven’t even read the chapter thoroughly myself, but of course I plan to do so eventually. But my first reaction was something close to underwhelm. I just didn’t want to leave a gap on my site. Everybody has probably already read it but I am making this post for recording purposes. One final remark: PLEASE SAKURA’S BODY, PLEASE REMEMBER EVERYTHING ASAP PLEEEEEAAAASE! PLEASE DON’T TAKE ANOTHER 6 VOLUMES! Another set of 28 pages for this chapter. 114 pages for volume 6 so far. A little more than halfway there for volume 6. Next chapter is out next month! I agree, I&m glad that I’m not the only one who felt anticlimactic about this chapter relating to previous chapter, too. Hey, thanks so much for your summaries. They give me life. i understand your only human but the only reason I know whats happening in the Manga is thanks to your summaries. So thanks so much for your input and hopefully next chapter gives you life lol. May you have a great day/week/year! So thanks so much for your input and hopefully next chapter gives you life lol. Hope all is well with you, Alex! I totally share your feelings on this chapter. We did get a little more information, and at least we know the real climax of the story will probably happen once Akiho enters Fujitaka’s library again. My hope for the series is that CLAMP uses one more volume to help flesh out the story a bit more and avoid a rushed ending. A Chinese fan on Weibo speculated that the plot would return to the typical “card-of-the-day” format, which in the long run would probably be terrible for sales and reader interest, wouldn’t it? I mean, we’ve got most of the mysteries of the plot resolved, with only Sakura and Akiho stuck in the dark about what’s going on. Given that Akiho took the initiative to find her family robe, and Sakura’s finally realizing that something’s wrong, it would feel really strained and contrived to drag the story out for six more volumes. Not only it was underwhelming, but they have already played the time warp card in Tsubasa. The last page with Sakura’s finger remembering the whole thing made me hopeful that it won’t take much longer until her whole body remembers. I was half joking for the six volumes thing, but CLAMP are very serious with numbers and there one side of me that keeps thinking that it’s gonna be 6 + 6 volumes. But there is another side of me that knows that CLAMP are unpredictable and that they could be willing to break this rule and have a 9 volumes series and leave it like that. yeah… everything i felt has been said by the other comments here. i will say im relieved though. i was dreading a sudden and rushed ending with plot leads left untouched, such as nadeshiko, touya, and the Li vs Reed family thing. 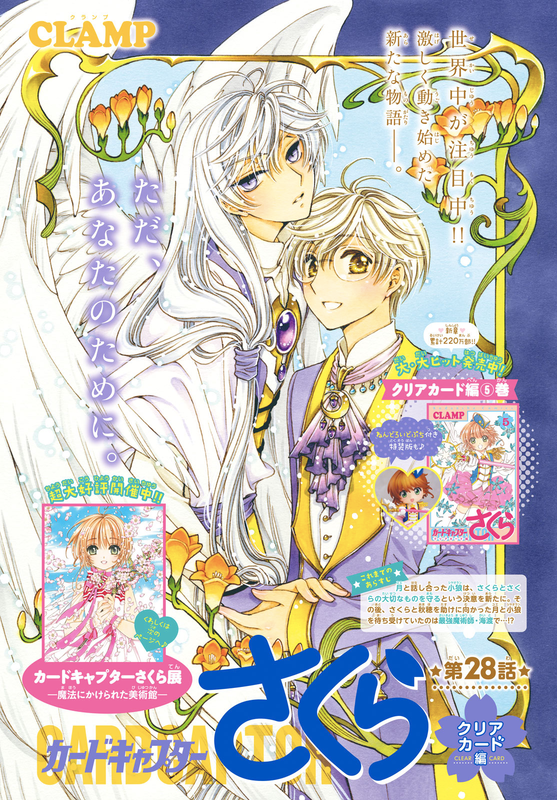 i want to see more of these magical families pretty please CLAMP!! i personally would LOVE to see sakura go all out agaist kaito, although that might be more of a shonen thing! but there is so much potential for a pretty epic fight between those two! forgot to say how much i LOVE that cover page!! yeah they’re quite similar, but I think they just resemble (of course knowing Clamp I can be wrong). If you compare the shapes the one in Trc is divided in two to be like two wings, while the one on the watch is a whole, like a fan. Hello, I can relate to the feeling you’re living, that sort of frustration we always have with Clamp works when we’d like answers and have nowhere to find them and the plot takes too long… Following them since RgVeda (like many others of course) I learned just to wait and have faith and enjoy the little details and their artistic skills even if I’d loved more solutions to some big doubts. You’re not alone please consider us readers as your support what about a multiverse? -> let’s make another mage but male related to Clow Reed (Watanuki) and let’s make his story being mirrored into another story with another male character related to Clow Reed -> who? -> gosh, Syaoran it’s perfect -> let’s make a Syaoran version of adventures as we did for Sakura in CCS -> bang! Tsubasa. Where, tho, characters are a bit older than CCS, hence more powerful. Done with that, going back to CCS, seeing that Sakura growing up, the only kind of power she were missing into the previous CCS was the “time warp” mess : for logical reasons Clamp were kinda “forced” to introduce again the “time” theme. My feeling about it, though, is that is a one-sense correlation, like CCS comes for first, letting its Sakura showing into a dream in TRC, while Tsubasa is just a parallel, created after that, built echoing it ok but staying like that. Well, at least I hope so. Sometimes I appreciate Clamp not just for the plots and character psychologisms, but just for the creative problem-solving attitude they have managing all this ying-yang, counterparts, mirroring processes they strictly respect everytime they create something. Not easy at all. At this point I just deeply, deeply, very deeply hope they’re not gonna HEAVILY MIX characters between CCS and Tsubasa, not just like occasional appeareances I mean, but like putting a Kurogane into CCS Sakura bloodline or a Fai into Yuna D. Kaito (dat D has already generated plenty of confusion among thousands of readers, I just see an “echo”, or a “sinchronicity” with the D. of Fai in Tsubasa, like into Clamp mind there is an association between European/Western magic and a classification of levels like that) or even Akiho bloodline or something messy like that, or a Watanuki popping out into a shop in Tomoeda like a CCS Syaoran cousin, just plz Clamp: leave your characters as main or secondary into their appropriate stories, there are already enough crossovers in TRC. hello! can i ask you why the english translation is not available? anyway the website is amazing!